In days past when our home also had a driveway, porch and patio furniture, we had so many books that my husband gifted me with a locally crated bookshelf one year for Christmas. In addition to new book titles, I collected old books acquired from thrift stores and garage sales. These old books became part of my home décor. Our bathrooms had baskets of books and our librarian knew us all by name. Books and reading was an integral part of our family culture. When we were in the planning stages of our suburban exit strategy, books became an area of concern. They are heavy. After all, they carry the weight of changed lives and struggles overcome. Heavy things are not welcomed in RVs; they are donated, given away or stored. While we had parted with many possessions willingly, this was a challenging area. A family book auction ensued, with each child bearing the responsibility and right to ransom a predetermined number of books from storage. These chosen few titles would adorn the bookshelf in our RV loft. Those that remained were packed away, banished from family life to silently wait as we gallivant around the US. Perhaps one of the aspects of suburban life that I miss the most is the ease of book acquisition. Requesting a new title from the library or ordering a used copy online was easy and hassle-free. I’d grown particularly accustomed to pairing our reading selections to things we were learning about in Science, History or Geography. Requesting a basket-full of titles on a weekly basis was not unusual. E-readers have since become a presence in our lives, but we still miss our weekly library visits and the resulting trip into the house laden with the weight of new literature. Transitioning away from this routine has at times put me in a state of withdrawal. To cope, I recently diverted my attention to the next most logical endeavor—curating an extensively thorough book list organized geographically. My logic was this: If I could no longer acquire baskets of books, I could perhaps focus on a few that would make the most sense for us to enjoy. Why not choose books with a geographical setting matching that of our travels? In order to choose a children’s book geographically aligned with our current location, I was going to have to set to work to find and organize applicable titles. Creating a book list organized by state seemed simple; until my husband wisely pointed out that I’d need a minimum of 100 books if I wanted even an average of two books per state. Undaunted, I set to work. How hard could it be? Turns out, it’s pretty hard. A lot of books don’t divulge the US state they are set in without some considerable digging. Other books give this information, but take place in a variety of locations. Some states are like the popular kids in school and seem to get all the attention (hello California and Florida). While at first glance other states appear to have not been invited to the party at all (looking at you Idaho). Enlisting the help of my librarian (thank you April), Amazon, Goodreads and a handful of discovered resources, I developed a list that left no state left out. In fact, I even included a section of books for the Mississippi River as well as a few for Canada. In the end, my 50 state book list contained over 300 titles of children’s chapter books organized alphabetically by state. Not only that, but they also include a plot summary and a link to find the book online. This was not a simple project, nor a quick one. I decided this was not a resource to keep to myself. Surely others would find this state book list useful. Perhaps you are one of them? Simply sign up for my blog post newsletter by clicking here. 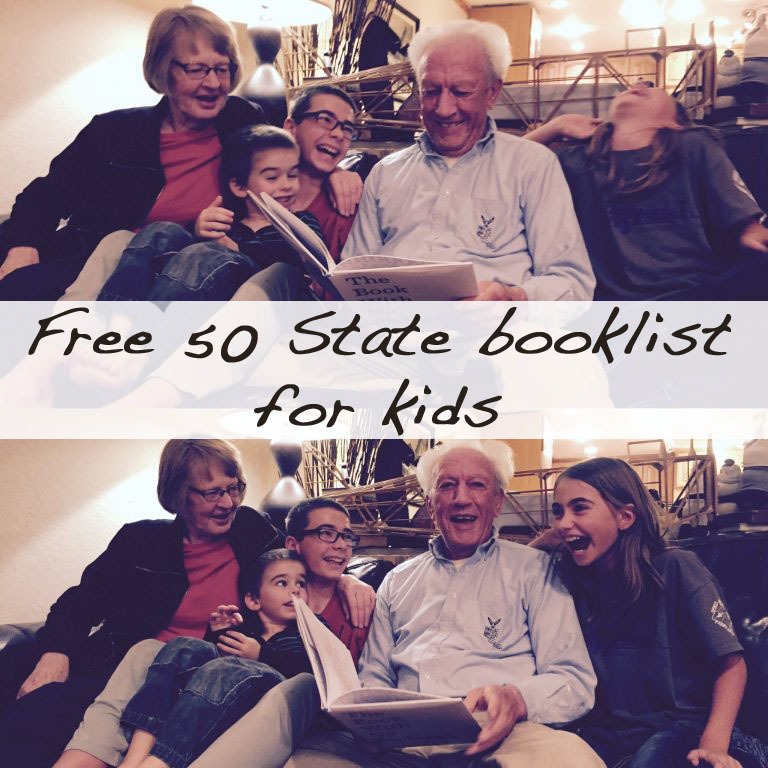 You will receive an email auto-reply with a link to download your own copy of my 50 state book list. If you know any other bibliophiles (a person who collects or has a great love of books), will you do me a favor and share a link to this post with them? I’d love knowing that the time I put into creating this list is benefiting others as well! Thanks for the book list! My kids and I will enjoy many of the books I’m sure. Wanted to add one of our all time favorites to the list – Charlotte’s Web was set in Maine. We are set to hit the road for full-time travel October 2017. I’m preparing our home now by paring down weekly, sometimes daily it seems. While these sessions have been so helpful, on many levels, I can’t begin to tackle books. I love books!! How to pare down our collection is my greatest worry and challenge at the moment. Thank you for sharing this list and writing this post so I know I’m not alone. Hey, We are in the process of researching RVs in anticipation of my husband retiring from the military. We’re planning to spend some time in an RV learning more about our beautiful country either on vacation or as we progress from military life to civilian life. I am super excited to see which books you chose, however, I’m having a really hard time finding the “sign up” link. Can you help me with that, please? Thanks!! Previous Previous post: St. Louis City Museum: Is it worth the cost?